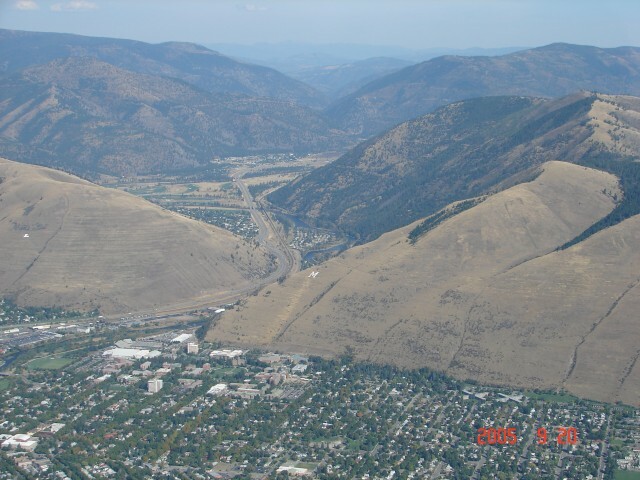 This is a picture of the "Hellgate" between Missoula, MT and East Missoula. The "Mountain Campus" of The University of Montana is below the "M". The former beaches of Glacial Lake Missoula are especially noticeable on the mountain on the left, Mt. Jumbo. This walking/driving tour begins just to the left of this picture, proceeds to the university area to look at the giant boulders (formerly thought to be glacial erratics) and ends with a drive up the Rattlesnake Valley to the left in this picture. An optional hike to the Mt. Jumbo 'saddle' will take you to the floor of a stream that flowed long before the last ice age. Your guide will be able to talk about this area for hours but be sure to interrupt with questions and let us know when your ears need a break.